Beating tray : Insects that frequent plants are often reluctant to fly or run, preferring instead to remain still and rely on their natural camouflage and small size to escape detection. Beating tray is a simple affair made of white cloth stretched over a frame of two crossed sticks. It is held or placed under a shrub or tree branch, to which you deliver several sharp blows, taking care not to damage the plant. Insects having taken refuge there will fall onto the beating tray and can then be collected by hand. 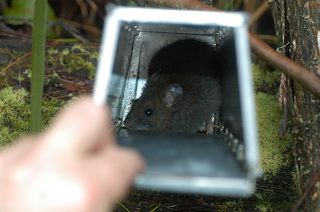 Pitfall traps : Pitfall traps are effective in catching insects that scurry across the ground rather than fly. Simply dig a small hole and sink a jar. Use yogurt pots with drainage holes and check every few hours. Place three or more strips of wood radiating from the rim like the spokes of a wagon wheel; these will guide insects into the trap. Bait traps : One of the major pastimes of insects is searching for food, and many species can be lured with bait. Pitfall traps or small containers suspended from a tree branch make excellent bait traps. Cover them securely with a large-mesh screen. A mixture of equal parts of molasses and water, fermenting fruit, or meat scraps all makes a fine bait. Cloth strips soaked in a bait mixture and suspended from a tree branch will attract larger insects, such as nocturnal moths, that cannot fit through the screen covering your other bait traps. Live trapping is an effective animal control alternative that is both humane and earth-friendly. Whether you are successful in catching a live animal depends on choosing the right bait and location among factors.Many people use live animals traps to capture animals like chipmunks, mice, rats, squirrels, rabbits, possums, raccoons, armadillos, groundhogs etc. They are usually made up of a rescue cage, divider, door hook, and burlap cover with some type of bait in the cage to attract the animal.